WILLEMSTAD – All the teams at the were commendable and showed true sportsmanship as the curtain came down Monday night at the 2017 Flow CARIFTA Games held at the Ergilio Hato Stadium here in Willemstad, Curaçao. Each athlete gave their all to represent their country and to try to bring home the coveted medal. This year the coveted Austin Sealy Award went to hometown boy Glenn Kunst of Curacao who had a phenomenal display when he broke the pole vault record which was 4.10m, more than six times before ending at a new height of 4.75m. The award was handed over by Sir Austin himself who was present through the ceremony. Jamaica finished with the most medals; 86 in total. The Jamaican athletes went home with 39 gold, 28 silver and 19 bronze medals. 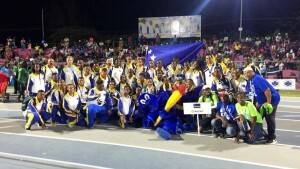 the Bahamas finished with 31 medals, Trinidad & Tobago 22, Barbados 12, Guyana 8, Cayman Island 6, British Virgin Islands 6, Antigua and Barbuda 5, Martinique 5, Guadeloupe 4, Curaçao 4, Turks and Caicos Islands 3, Grenada 2, Bermuda 2, Dominica 1, Saint Kitts and Nevis 1 and French Guyana 1.